This attractive bay fronted detached family home offers an interior that not only provides comfortable and well laid out accommodation to suit modern day life, but an immaculate and ready to move in finish which will leave you wanting to move straight in! The location allows for excellent access to the local amenities that the village of Tilston offers, including village shops, pubs and restaurants, and with motorway networks within easy access, the location is convenient to get to places of business as well. Vitally important, this home is located within the catchment area for the desirable Bishops Heber High School. 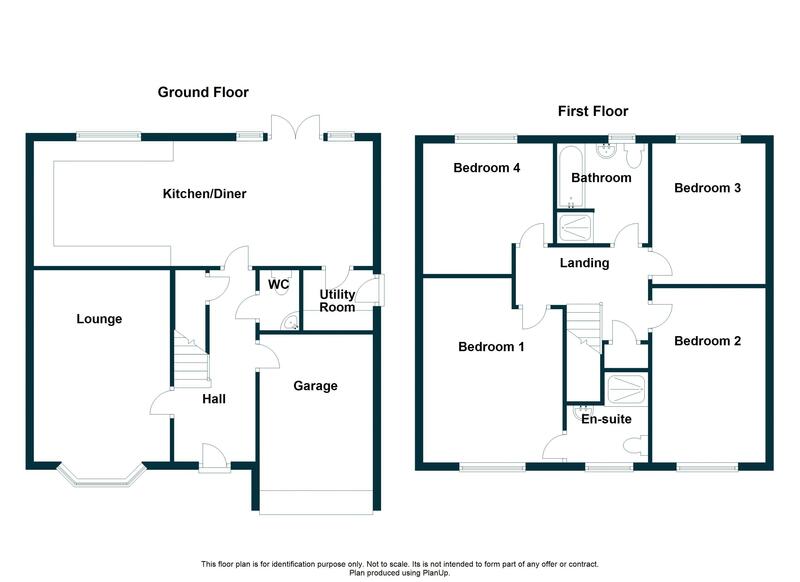 The stylish home comes with an entrance hallway offering a staircase rising to the first floor and access to the downstairs WC, whilst doors open into the lounge, kitchen/diner and internally to the garage. The lounge enjoys a spacious feel and an attractive walk into bay window, whilst to the rear there is an all-important open plan kitchen/diner, featuring attractive grey fronted high gloss units with ample space for both living and dining. The open plan aspect and doors opening out to the rear garden make it a great place for entertaining and modern-day family living. A rarity in itself is the luxury of four double bedrooms, ideal for any growing family! 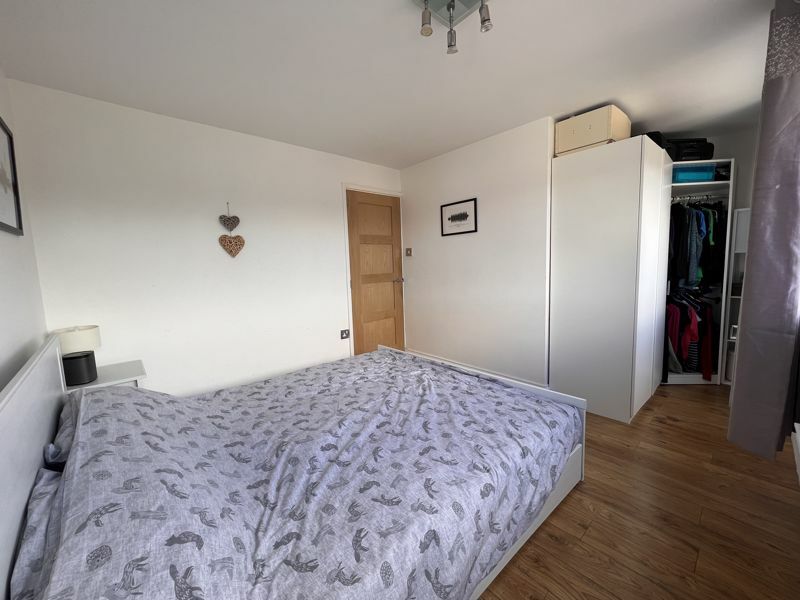 The master bedroom affords a lovely en suite shower room, whilst bedrooms two, three and four share the well fitted modern family bathroom, both bathrooms coming complete with stunning upgraded tiling. To the outside there is ample off-road parking, leading to the integral garage to the front, whilst the rear garden has been tastefully landscaped with well stocked borders and a designated lawn area. A beautiful family home in a beautiful location! Tilston village is located in the heart of the Cheshire countryside, approximately 20 minutes from Chester City centre and approximately 5 minutes from the popular village of Malpas. Tilston itself has an excellent range of local facilities which include a reputable primary school, local village shop, public house, village hall and a beautiful church. Pleasant walks can also be enjoyed along the lanes and footpaths which encompass this charming village. 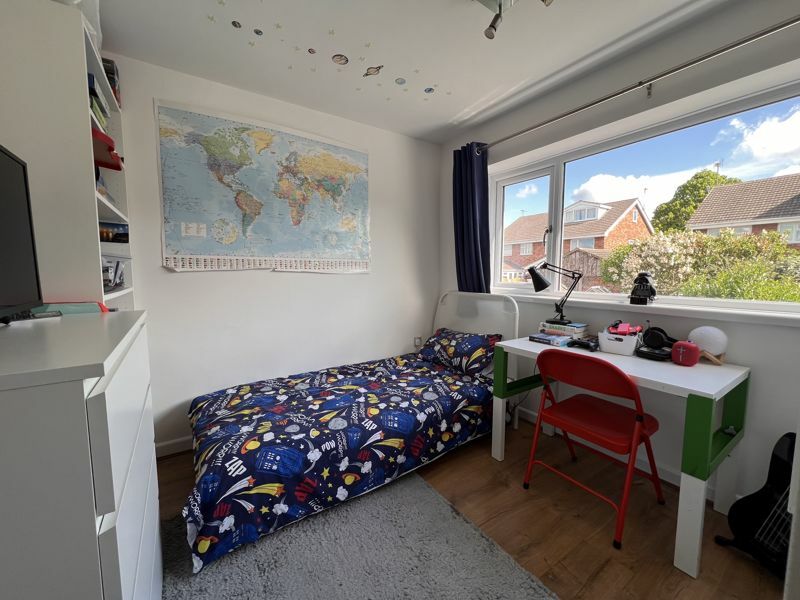 The property is also located with catchment for the highly desirable Bishop Heber High, which is an ‘Outstanding’ secondary school (Ofsted, 2011), situated in the neighbouring village of Malpas. Composite entrance door with inset double-glazed windows. Oak laminate flooring with underfloor heating. Staircase rises to the first floor with useful storage beneath. Two ceiling light points. Secure internal door leads into the integral garage, whilst further internal doors lead into the downstairs WC, lounge and kitchen/diner. Fitted with a low level WC. Wall hung washbasin with chrome mixer tap and tiled splashback. Oak laminate flooring with underfloor heating. Extractor fan. Chrome heated towel rail. Ceiling light point. PVC bay window to the front elevation. Underfloor heating. TV aerial and power points. Ceiling light point. A bright and spacious room with plenty of space for both dining and living. The kitchen is fitted with a contemporary arrangement of high gloss wall and base units, incorporating drawers and cupboards. The work-surface has matching upstand and houses a stainless-steel sink with drainer and mixer tap. Power points to the work-surface area. Integral Neff appliances include a double oven and grill, four ring ceramic hob with stainless-steel splashback and extractor hood over, integral dishwasher and fridge-freezer. Tiled flooring with underfloor heating continues through to the living and dining areas, where there are further power points and a TV aerial point. A combination of recessed spotlights and ceiling light point. PVC window to the rear elevation, along with PVC French doors with full height adjoining side windows which open out onto the rear garden. Internal door leads into the utility room. Fitted with wall and base units matching those in the kitchen. The work-surface has matching upstand and houses an inset stainless-steel sink with mixer tap. Power points to the work-surface area. Tiled flooring with underfloor heating continues through from the kitchen/diner. Extractor fan. Ceiling light point. PVC door with frosted inset window leads out to the side elevation. Spindled balustrade. Radiator. Power points. Ceiling light point. Door provides access to built-in airing cupboard which houses the hot water cylinder tank, with useful additional shelving. Further internal doors lead into the four bedrooms and bathroom. PVC window to the front elevation. Radiator. Power points. Ceiling light point. Internal door leads into the en suite. Fitted with a modern three-piece suite to include a fully tiled shower cubicle with fixed rain-shower head and mixer shower attachment. Low level WC. Washbasin mounted onto a vanity unit with useful cupboards beneath. Stylish fully tiled walls with contrasting tiled flooring. Radiator. Extractor fan. Recessed spotlights. Frosted PVC window to the front elevation. PVC window to the rear elevation. Hatch providing access to loft space. Radiator. Power points. Ceiling light point. Fitted with a stunning four-piece suite to include a fully tiled shower cubicle with fixed rain-shower head and mixer shower attachment. Panelled bath with chrome fittings. Low level WC. Pedestal washbasin. Stylish fully tiled walls with matching tiled flooring. Heated towel rail. Extractor fan. Recessed spotlights. Frosted PVC window to the rear elevation. The property is situated within a quiet cul-de-sac of similar style properties. Set back from the road there is a lawned garden frontage, along with a block paved driveway providing off-road parking for two vehicles and leading directly to the integral garage. A secure gate to the side gives access to the rear garden. The rear garden has been beautifully landscaped to provide established and well stocked borders which wrap around a designated lawn. There is a lovely patio seating area accessed directly from the kitchen/diner. Hardstanding for a garden shed and summer-house. The garden is fully enclosed with panelled fencing and enjoys a completely private aspect. Up and over door to the front elevation. Wall mounted Gloworm boiler. Power points. Ceiling light point. The NHBC warranty has six years remaining. From Chester, proceed out through Boughton, and onto the A41, passing the villages of Christleton, Waverton and Tattenhall. At the Broxton roundabout, proceed straight ahead and after approximately 3 miles, take the signposted turning for Tilston on the right. Continue along the lane until reaching the village of Tilston. Turn left and then immediately right into Inveresk Road. View or download the Energy Performance Certificate for Inveresk Road, Tilston, Cheshire.